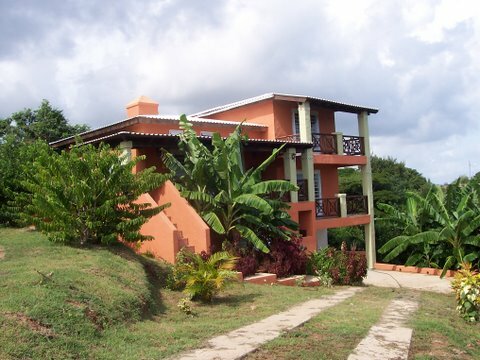 Thank you for inquiring about our home on Vieques, Puerto Rico. My husband and I had the two houses designed and built by an Argentinean architect, friend and real estate partner — Ricardo Merlo. We built it for our pleasure and for the use of our family and friends. We rent it, loan it to friends and occasionally trade it but in all cases, assume that strangers interested in our home and in Vieques are just friends we don’t know yet. We have a house manager named Dayanara Cruz and her husband Jose Cordero is our repair person of all trade. If you have rented the house, the rental agency will get in touch with them directly and if you are friends or trading make sure I send you contact information under separate cover. Call Dayanara before you arrive to tell her what time to expect you. She will have cleaned the house and will meet you and take you to the house. I will have called her first to allow you to use the property. We chose the location for the view, which has 180-degree view of water, and the surrounding populated small hills. Our homes sit on the top of the hill to catch the breezes and are a short walk to the island’s main village, but are a drive to the best beaches. The Pilot House (Casa Piloto) was completed in 1995, has three bedrooms, two baths and a living room, dining room and kitchen combination. The guest house, Casita Omi, was completed in 2004. Each has appliances which includes washer, drier, and dishwasher as well as stove, oven, microwave, and refrigerator / freezer. The homes are fully furnished with small appliances and are equipped with towels, sheets, blankets, dishes, pots and pans, etc. The Pilot House has a telephone (787-741-1769) on the premises. The Pilot House is equipped with a radio, CD player, TV and VCR. The Casita is not and does not have a phone. Each has a heavy-duty blender for the all-important Pina Coladas. The homes resemble like each other in style and content. The Pilot House has three bedrooms and sleeps six, while the Casita has two bedrooms and sleeps four (with a futon in the living room so possibly 5). Each room has a view of the water and a walkout porch or deck though the vegetation has grown narrowing the view. The master bedroom in each house is one flight up with its own bath and has a queen size bed. The second (and third bedrooms) have twin beds. There is a second bath in each house. Each bath has a shower. There is a portable crib and high chair in storage. Babies and children are definitely welcome, but pets are not. Each room is comfortably furnished in an intentionally minimalist way. Thus, each room has a closet with built-in shelves but no bureau. There is the ubiquitous porch furniture and living room sets of rattan. There is an indoor desk and a location for a porch desk both wired for your computer and your Internet connection. Both houses are wired for wifi. 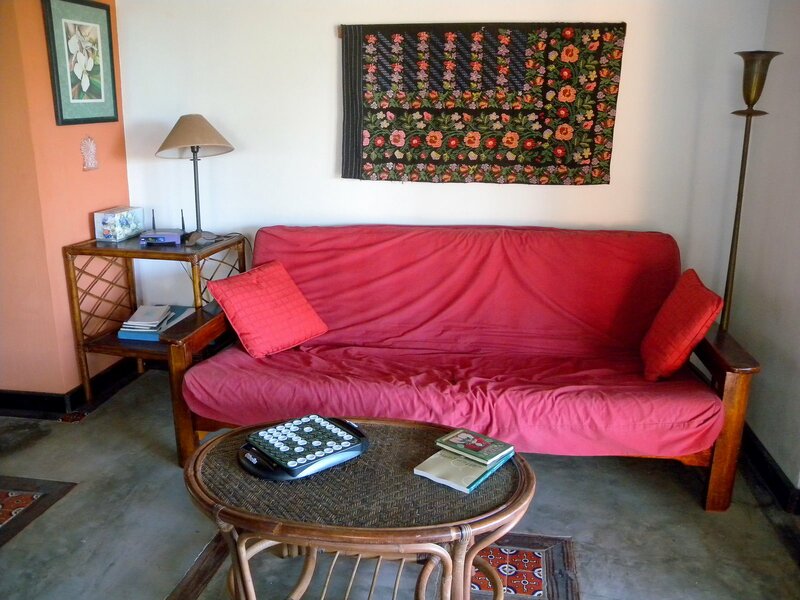 The pictures on the walls have been painted by friends or represent the travel art of a bygone era. We suggest that you record your impressions in a book left for that purpose and leave behind any completed books you do not wish to carry back. Please take out all shells or other trinkets and don’t add to the house decor. The Pilot House is equipped with a radio, CD player, TV and VCR. The Casita is not and does not have a phone. Each has a heavy-duty blender for the all-important Piña Coladas. Each room is comfortably furnished in an intentionally minimalist way. Thus, each room has a closet with built-in shelves but no bureau. 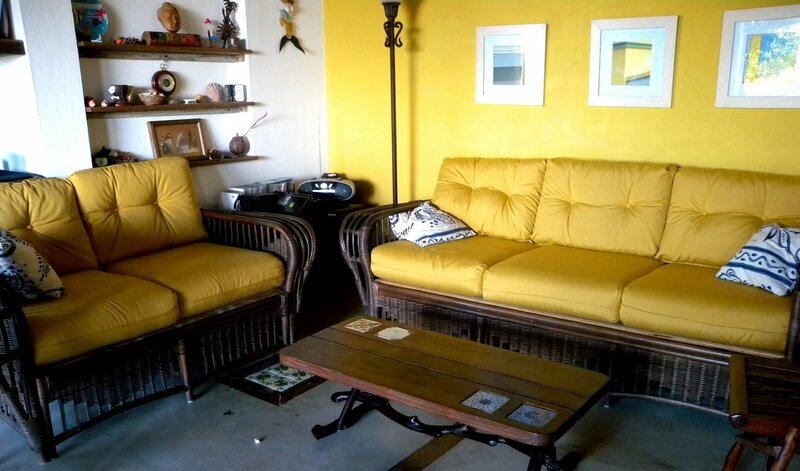 There is the ubiquitous porch furniture and living room sets of rattan. There is an indoor desk and a location for a porch desk, both wired for your computer and your Internet connection. Both houses are wired for wifi. The Pilot house connection is Linksys and the Casita connection is Gurian Network. You will get a separate note with the passwords. These both work outside the house as well so sitting on the porch is just fine. The pictures on the walls have been painted by friends or represent the travel art of a bygone era. The books on the shelves are yours to read, take and give away, the ones you have brought can be added. There are board games and toys in the living room of each house for you to enjoy. And there are copies of “Vieques Insider” with much useful information. There is a hammock and a set of hammock hooks on the front porch in the Pilot House and the upstairs deck in the Casita. Vieques is an island, about 21 miles long, off the east coast of mainland Puerto Rico. 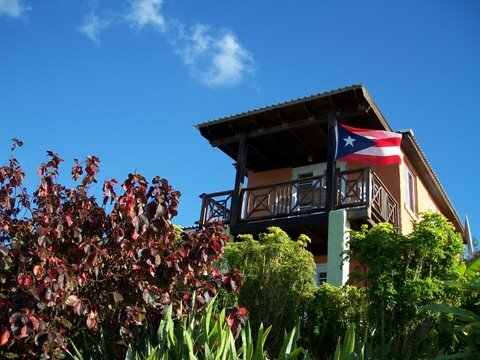 It is ecologically part of the American Virgin Islands and, in fact, one can see St. Thomas and (on good days) St. John from the master bedroom window (just as one can also see the island of Culebra and Fajardo on the mainland of Puerto Rico from the same porch). Much of the island became a US military base in the early 40’s when both ends of the island were forcibly evacuated and the people resettled into the middle third. The land remained US military property until May 3, 2003, which inadvertently made it an ecological preserve with a large brown field bomb site. The military base has now been given to the US Fish and Wildlife Service making it the largest wildlife reserve in the Caribbean. The beaches have been reopened and the Navy is cleaning up the other sites. There is a fragile tourist and construction based economy. Many of the young people migrate to other islands or mainland US in search of better opportunity. They often return home after working some years elsewhere. Puerto Rico is a commonwealth and the islanders have a mixed reaction to their status, having voted not to become a state but not liking their inability to effect their own development. On the positive side for visitors, the island has never been extensively commercially developed and there is no large-scale construction anywhere (though Vieques has been discovered.) There is a W resort on the island that is very beautiful and great to have drinks at. This means that except for some Puerto Rico holidays, the beaches are not crowded and always gorgeous. There are no high-rise buildings, boardwalks nor casinos to mar the view of any beach location. There are no movies, very few street signs nor paved roads. It has a population of less then 12,000 during the height of the season and around 9,000 during low use periods. If you like a beautiful place to swim, snorkel, read and unwind then this is the place for you. On the negative side, Vieques has mosquitos and therefore Dengue, Chikungunya and Zika are possible. All beaches are beautiful. You can go to a different one every day and not be disappointed. Vieques has a good-sized public beach called Sun Bay near Esperanza. Explore the small beaches (Navio and Media Luna) behind it. Red, Blue, Silver, Secret Beaches which now have Spanish names are in the old Navy base. Green Beach is on the other military base past the airport. It is the place where yachts will come on the weekends. No-see-ums can bite at sundown on all beaches. The world’s best bioluminescent bay is in Vieques and a nighttime guided tour is must for all first-time visitors. Two small towns are on the island — Isabel II and Esperanza. They are both worth exploring. There are a few small guesthouses, quite a few houses to rent, and a few good restaurants and bars. Everyone has their own favorites and will be glad to tell you. During the winter season it is essential to make reservations and during the non-season it is important to find out if they are open at all and on what days. You can rent four-wheel drives from a few car rental locations. Our house manager –Dayanara Cruz – may be able to supply one cheaper if you wish. However some guests have successfully walked to town and taken the “Publico” to the beach and saved the money. There are not enough rental cars on the island and renting in advance is a must. You get to the island by flying to San Juan and then taking Vieques Air Link or Cape Air. They fly from the international terminal or, for a slightly cheaper price, Vieques Air Link flies from Isla Grande, the commuter airport in San Juan which is a taxi ride from the international airport. You can also go by Ferry taking a publico to Fajardo or fly on Vieques Air Link taking a publico to Ceiba. Read the internet about all of these and decide for yourself between cost and convenience. You must have reservations. There are other charter companies flying to Vieques now so check out Sun Country or Air Flamingo and see if they are running. Our house has no street numbers so once you decide to come, we will send you a map and house rules and advice. We have a house manager (Dayanara Cruz) who will meet you there and turn over the keys and let you know how all parts of the house work. Vieques is a place where there is almost no violent crime but there is plenty of creative reapportionment. Things are stolen from cars, from things left unattended on the beach and from house break-ins, so locking up is important. The room with the washer and drier in both houses is lockable storage to which you have a key. We suggest that you do not bring valuable jewelry or very expensive equipment with you at all. Spanish is the preferred language and while there is a “Nortday-Americano” population and everyone speaks some English, this is definitely a Spanish-speaking society. The people are kind and helpful. They prefer that you do not show up in town in revealing clothes even if their own youngsters wear them. There is no place to wear a tie and jacket and almost all business interactions are done in casual slacks, shorts, jeans, and tee or sport shirts. The houses are not air-conditioned. The houses are on the top of the hill and catch the breezes. Every room has an overhead fan and additional fans are located in every bedroom. Life on the island is lived outside. The island is noisy with the elements of life that we no longer hear in more urban settings — dogs, chickens and roosters roam free and cry at will. Horses a blend of Paso Fino horses, left by the Spanish conquistadors, and others also roam free though some young boy has probably claimed and occasionally rides each one. People play their radios and TV’s so that they can hear them outside and the evangelical churches will hold their prayer meetings with windows open. For urban folk, it takes some getting used to. Vieques is a real place that has not been manicured. Houses are often in a state of uncompleted good ideas and cars are always being repaired in the front yard. There are two “super markets” and plenty of local food stores and do-it-yourself home construction hardware shops. This island is always in the state of becoming and decaying. Not too fast however as some shops close midday so that the shopkeeper can go home and have a leisurely lunch. Vieques does not work well if you are used to efficiency. The electricity and the water can go off intermittently. Drivers do not honk their horns but wait for the car in front to move. Home owners wait for the repair person to show up sometime within the week. This is not the place for you if you wish things to be perfect. And everyone knows how we could fix it if we wanted, the truth is we like it the way it is. If you delight in the imperfections of life, and the simple beauty of gorgeous nature, you will love it here. Replace anything that might break. Add any small equipment that you think the house needs. Take away all souvenirs that you collect at the beach. The house has an extermination service so tell Dayanara if you see any live pests. Take only the printed and striped towels to the beach and leave the solid-colored ones for use only in the house. Replace any condiments, cleaning material or foodstuffs that you use up, regardless of how little you found when you got there. Put opened food into closed containers and refrigerate. Give all the open unused foods in the refrigerator to Dayanara when you leave, but leave all unopened canned food and drink for the next person to enjoy. 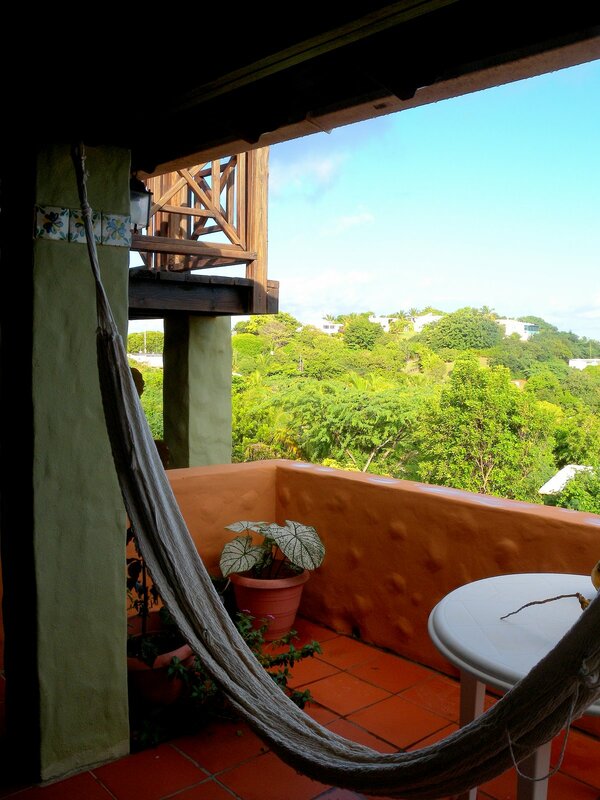 Leave any unread books and all the Vieques material for the next guest. Always lock all the many ground floor doors when you leave even for a short time. You do not have to close the louvered windows since each of them has security bars embedded in them. However, lower the ones on the kitchen wall (and the one near the bed in Piloto) when you go to sleep at night or it will rain into the house. The gate is electrified and please keep it closed all the time so the horses will not migrate into the yard and eat the flowers. They will do a lot of damage quickly. Put out the garbage in the receptacles on the road so the trucks can pick it up. Keep a lid on it or the garbage low down in the can or the horses will eat it and make a mess on the road. You can leave the porch furniture out on the porch during your stay but please put it back into the house before you leave. Call Dayanara before you arrive to tell her what time to expect you. (I will send the number.) I will have called her first to allow you to use the property. Tell Dayanara when you are leaving so that she can have the house cleaned and closed. Please strip the beds and wash the dishes before you go.